Why is VoIP cheaper than standard phone systems? With a standard phone line digital voice signals are transmitted through fibre-optic cables and into a national network of switching stations before arriving at the intended recipient. With a VoIP system those signals are sent via Internet instead. Digital voice signals are sent to the phone belonging to the person you are trying to call. In order to do this, a connection must be made from your phone to theirs, which is known as a circuit. This takes up some of the capacity of the telephone line, called the bandwidth. Rather than maintaining an open two-way circuit between two lines as is the case with analog phone systems; a call made over VoIP sends data only when data are created. This means that the circuit is only activated for the speaker and not the listener, which reduces by half the size of bandwidth required. This makes VoIP telephony cheaper, and as a result service providers often give away extra features which traditional providers charged extra for. Calls are cheaper, and with the ability to adapt your existing telephones to the system, there is not even a need to buy specialised hardware. 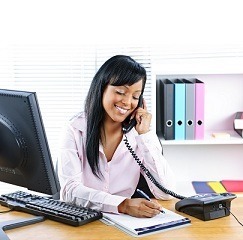 With VoIP, you can get features as standard that would cost you extra on a traditional phone. As long as you have a broadband connection, your office is suitable to be upgraded. You also have the option of installing software onto your computer that grants you all the services of a standard VoIP system. This means you can use your computer as a telephone, or Softphone. All you need, on top of the broadband connection required for all VoIP services, is a headset or microphone, and you can make calls to anywhere in the world from your computer.